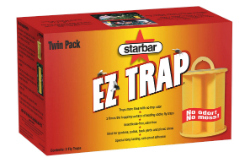 EZ Trap® fly trap has a unique, compact design, which offers a large trapping surface in a compact trap that can be used indoors and out with no harmful chemicals. Insecticide-free and odor-free, ideal for stables, kennels, gardens, and homes. Just hang it up, stand it up, or stack it up on garden stakes and watch the special long-lasting, rain-proof adhesive go to work.